Double O Arch at Arches National Park. Ahead of an event in Logan on Tuesday called A Climate Change Solution Worth Dancing About (sponsored by Citizen’s Climate Lobby, Cache Valley Chapter), we’ll talk about climate change science and activism and ask you what you think and what you’re doing to try to effect change. Our guests will include Dr. Rob Davies, Associate Professor of Professional Practice in the USU Physics Department; writer and photographer Stephen Trimble, and climate activist and U of U graduate student Brooke Larsen. A Climate Change Solution Worth Dancing About is Tuesday 7:00 to 8:30 p.m. at the Whittier Community Center, 290 North 400 East, Logan. 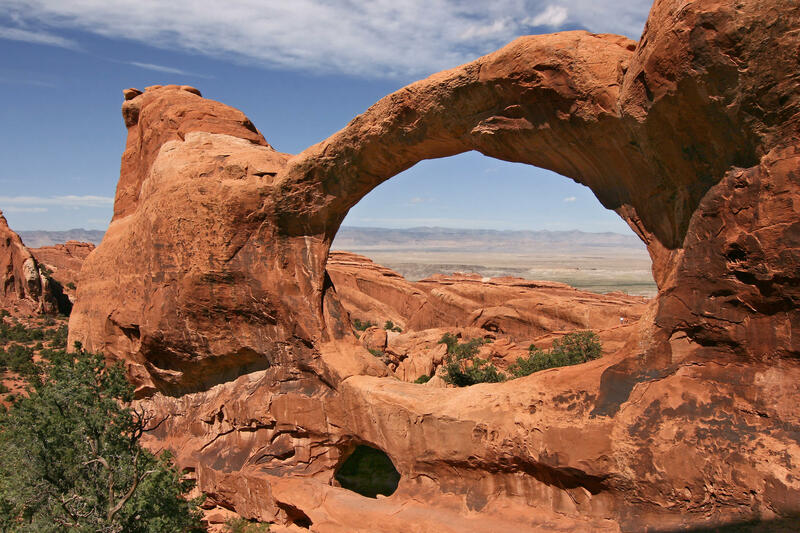 We have established an Access Utah tradition: On or near Earth Day each year we invite Utah writer Stephen Trimble and other guests to talk about the earth, the land, and the environment. Trimble suggested we focus on the Torrey House Press this year and specifically focus on their blog which is full of powerful posts written by young authors who are passionate about our beautiful planet. Clement Chow studies how—and why—two people can get the same disease and have very different outcomes. Josh Tewksbury's research team has developed a model indicating how human-caused climate change stands to make insects much hungrier. Together, we'll try and build some bridges between those two very different areas of research.